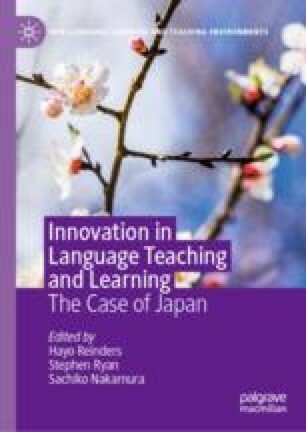 This chapter suggests modifying several teaching techniques in order to improve Japanese older adults’ foreign language learning. Such innovations include enhanced learner training, older learners’ reassessment of their abilities and their preconceptions regarding learning in old age, and the adjustment of content and content presentation. Although quantitatively inconclusive, qualitative data showed that these innovations enhance older adults’ learning experience and may improve performance in the long term. The study questions the common notion that older foreign language learners’ challenges result mainly from age-related cognitive decline and not from methodological issues. Also, this discussion promotes considering learner re-training as foundational to foreign language geragogical programs, and it argues that adjusting our views of how and why we teach foreign languages to older adults is crucial for a satisfactory learning process. The study discussed in this chapter was introduced in two previous reports (Ramírez-Gómez, 2015, 2016b), which presented a variety of analyses. Nonetheless, the issues and analyses presented here have not been included in any other publication. Council of Europe. (2009). Common European framework of reference for languages: Learning, teaching, assessment (Council of Europe, Ed.). Cambridge: Cambridge University Press [u.a.]. Retrieved from http://www.gbv.de/dms/bowker/toc/9780521803137.pdf. Davies, M. (2002). Corpus del Español: 100 million words, 1200s–1900s. Retrieved from http://www.corpusdelespanol.org. Ramírez-Gómez, D. (2016a). Critical geragogy and foreign language learning: An exploratory application. Educational Gerontology, 42(2), 136–143. https://doi.org/10.1080/03601277.2015.1083388. Ramírez-Gómez, D., & Escandón, A. (2017). Validating learning profiles as an alternative approach to the study of the effects of learning experiences. Electronic Journal of Foreign Language Teaching, 14(1), 37–52. Retrieved from http://e-flt.nus.edu.sg/v14n12017/ramirez.pdf.